The picture is of a chapel with vestiges--here a classical column built in, just right of the lower center. William Gell noted this site as he passed by, one eye on his watch, the other on his notebook. Gell (1777-1836) was a wonderfully obsessive traveller, documenting his modern Greece of the 1810s against Pausanias, and then noting the minutiae of his modern Greece for the travellers he hoped would follow him, and then writing up his interesting experiences and candid descriptions for people who were sensible enough to stay at home, grateful for the blessing of being English, instead of Greeks or Turks..
To those who may consult this volume as their guide on the road, the advantage of noting every well, rivulet, mill, or farm-house . . . will soon be apparent, in a country which does not abound in water, where every stream has its history, and where every object assists in determining the direction to be pursued, when the road is nothing better than a track frequently interrupted. 11 The last sign of Mistra. This road is the same as that to Leondari. 15 A ruined aqueduct, with two ranges of arches, with a stream under it. 3 The road turns back a little, and a river falls into the Eurotas. 13 Following the glen of the last river, ascend. R. across the stream, a rock with the appearance of antique vestiges. 9 Very bad road, on a summit. Descend. A church r.
5 Vestiges. A few trees. Bare hills. A stream from r.
2 A fount r in a field. 5. A red mountain, Krabata, l.
15 Stream r. of the road. 4 A tumulus of stones r. See r. a fine mountain with pines. At the end of this route you learn that to go from Mistra to Krabata takes 3 hours 48 minutes, a time that assumes you are riding a horse and have a companion-servant-translator who is walking. I personally think you want a happy translator and should have got a horse for him, too, but Gell travelled constantly and seems to have known what he was doing. In fact, all of his measurements of routes and times were taken from the same horse in order to give them consistency. or order from the Sultan, permitting him to pass unmolested, and recommending him to the attention of the . . . Pashas of the Morea . . . An order for post-horses may be annexed to this, by which, wherever the post is established, good horses may be had, nominally free from expence, but presents ought to be given . . . This firman should be procured by the ambassador at Constantinople and sent to . . . the first port hwere the traveller enters the country. If this does not arrive . . .
. . . horses seem the best mode of conveyance. Some prefer mules, from an idea of their caution in dangerous or rocky situations, but the horses of the country are equally accustomed to the roads, and are not only more docile, but free from the trick of lying down in the water with luggage, which is frequently the practice of the mules. Horses could be got for five or six pounds each at the beginning of the journey, and sold at the end. It was necessary to hire Greeks or Turks to care for them and the baggage. So, realistically, the trip from Mistra to Krabata would likely to take somewhat longer than the 3 hours and 48 minutes that you and a single attendant would require. The baggage to occupy the attending Greeks and Turks would include: a mattress, and a piece of oilcloth to wrap it during the day, and to put on the ground at night; a small carpet for sitting on the ground; a knife, fork, spook, plate, cup, and a pot for boiling water; an umbrella with an iron spike for fixing it in the ground; silk curtains for protecting the bed from mosquitos. The baggage would also contain presents for the hosts who might offer you a place to spend the night. Depending on circumstances, a watch or cut glass cup might be appropriate, but ordinarily one could do just as well with imitation jewellry such as red glass beads, and particularly imitation pearls. 17 The glen opens into the plain of Argos. R are ruins, on a projecting hill. 8 The plain, covered with stones, some of which have been collectd into a large heap, 400 yards r.
20 A peribola, or garden, r. L. on a hill, a pyrgo. Villages; churches; two wells, and the fragment of a column. 8 Village, r. L. a church. Ancient foundations r.
15 Three villages r. Pass through a village. 3 Ruins of Tirynthus, and a well. 30 Enter Nauplia, having turned r. at an angle of the bay. At Nauplion -- fortunately you are not in the mountains where you may have to stay at the wretched khan if the tower is occupied, and the boys at Argos throw stones at strangers (this happened to us, too, in another century) -- and if you are coming from Corinth you should watch out for the chapel with the guard who will check to see if you are bringing plague with you -- have a bath. Preferably not when the bath is crowded. The first apartment has a fire in the centre, and around the walls are several sofas . . . which have clean sheets and blankets . . . the bather is stripped, a cotten cloth is wrapped round him, and he is conducted in wooden pattens through several vaulted rooms, each hotter than the last, to a chamber, where he is placed upon a wooden platform about the size of a door, and raised four inches from the pavement. His profuse perspiration is rubbed off by one of the attendants . . . After this, a bason full of lather is brought, and the baqther is rubbed with a soft brush made of an oriental plant . . . On clapping the hands, the attendant brings a fresh dress of cotton cloth, which is wrapped round the waist, and another in the form of a turban is placed on the head. He is then . . . placed between the sheets, and drinks a cup of coffee while he is drying. Those only who have tried can judge of the wonderfuly cleansing and refreshing effect of this custom. 1 Now there was a council of the priests, and they said: Let us make a veil for the temple of the Lord. And the priest said: Call unto me pure virgins of the tribe of David. And the officers departed and sought and found seven virgins. And the priests called to mind the child Mary, that she was of the tribe of avid and was undefiled before God: and the officers went and fetched her. And they brought them into the temple of the Lord, and the priest said: Cast me lots, which of you shall weave the gold and the white and the fine linen and the silk and the hyacinthine, and the scarlet and the true purple. And the lot of the true purple and the scarlet fell unto Mary, and she took them and went unto her house. . . . Mary took the scarlet and began to spin it. 1 And she took the pitcher and went forth to fill it with water: and lo a voice saying: Hail, thou that art highly favoured; the Lord is with thee: blessed art thou among women. And she looked about her upon the right hand and upon the left, to see whence this voice should be: and being filled with trembling she~ went to her house and set down the pitcher, and took the purple and sat down upon her seat and drew out the thread. 2 And behold an angel of the Lord stood before her saying: Fear not, Mary, for thou hast found grace before the Lord of all things, and thou shalt conceive of his word. 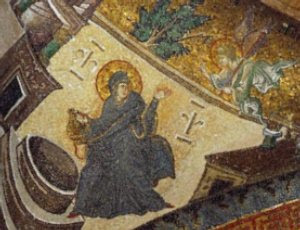 Orthodox icons have consistently shown Mary spinning, though the painters and mosaic workers may not have been perfectly clear about distaff and spindle, but as here, there is some indication of purple or scarlet wool, usually scarlet. 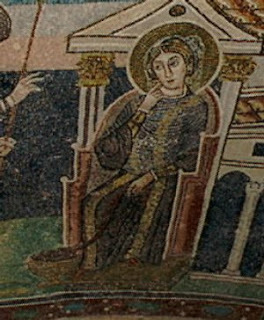 The idea of the Queen of Heaven doing manual labor was no problem to the Orthodox of the Eastern Roman Empire -- they had inherited the Homeric tradition where Penelope--a queen--weaves; Arete, another queen, spins purple; Helen weaves, and spins purple; and goddesses weave. 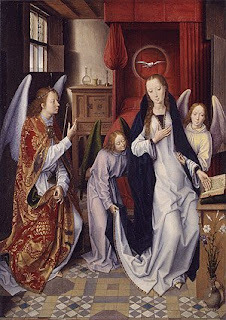 As images of the Annunciation became more popular in the West where queens did not work and the idea of spinning made no sense, despite what the Protoevangelium said, the wool disappeared, to be replaced by a red book. In church symbolism, Mary represented the Old Testament and the Book of the Law, but she was also literate and of good family. Sometimes she sat to read, and sometimes she knelt to read from her prayer book, and someone has written on the theory that in Florence the size of the book suggested the degree of popular participation in government. Possibly the image of the book was reinforced by the comments in Luke that Mary asked questions and thought about things. The image of a queen began to drift away and another image began to appear: that of a lady in a bedroom. The image of a woman alone in a bedroom implies the rise of a class of people who were literate and who could afford these paintings--often private devotional images--and the development of the idea of privacy. The image also suggests the affluence of a household that could give over a room to a young woman. The painters were making their statements of theology, possibly they sometimes painted a room in their clients' house, and they were also suggesting that this private room in their clients' home could be a sacred space. But the bed has another implication--very simple, really--and that has to do with where babies come from. The painters were not arguing with the Gospel of Luke and the Protoevangellium. They and the people who bought the paintings and who said what they would like to see in their paintings were simply being realistic, and possibly the painters were painting the rooms, or rooms like the rooms, in which their paintings might hang. And possibly the annunciation of a baby in a bedroom offered hope that the people who used that bedroom would have their own baby. Greek Christians of the 5th and 6th centuries mostly didn't spell very well. Their grave markers were smaller than a piece of typing paper and the lettering on this is much better than most. All we can say about Anastasia is that her parents were Christian because they named her for the Resurrection. Christian epigraphs sometimes mention occupations, so that among those from Corinth we get teamster, deaconess, servant, pickle-maker, bath attendant, guardsman, city council member, and goatherd. Argos has produced less than a tenth of the epigraphs of Corinth, but among those are anothe rmember of the city council, a maker of lampwicks, and a silentiarios who was a court official from Constantinople but his stone is misspelled and badly carved, and it is difficult to think what he was doing in Argos. In Argos there are fewer than twenty Christian epigraphs--"resting place" identifies a Christian grave--and two Jewish, and sometimes small narratives are implied. One tiny stone suggests that Theodote died, and her parents had a stone carved for her, its inscription beginning and ending with a cross. Then her sisters died and their names had to be added. Perhaps there is another explanation, but I think of the shock of parents who have lost three daughters. Rhoda lost a daughter, too, one she had named for Sunday, and that she was poor is suggested by the fact that she had to make use of a stone worn down by use possibly as a stepping stone. Rhoda could, at best, have earned about 5 solidi a year, and she could have made the choice to sell Kyriaki to a brothel for that much. If she had had to buy a gravesite it would have cost her about 3 solidi. Still, her stone suggests something disturbing about Argos. We are talking about survivals, not actual original numbers, but survivals are all we have to work with as historians and archaeologists. There is a higher percentage of anti-Semitic epigraphs from Argos than from any other late antique city. The monastery was dedicated to the Apostle Paul, and the surviving stones and inscription from the small sanctuary are so beautifully carved that I am tempted to think that Ariadne had been their benefactor. There is something else, quite provocative. Two generations after establishing their monastery, the monks seem to have acquired part of one of the houses next to the baths, which they used for an entrepreneurial effort. The private bath of the house (attached to a working aqueduct) has produced vast numbers of lamps marked with crosses, and some three hundred glass vials marked with A and a cross. It looks as if the monks in the Argos baths were selling, or giving in exchange for contributions, water in these vials purported to come from the great spring near the basilica and monastery of the Apostle Paul at Kefalarion. This is perhaps an unfair assumption, based on too little evidence, but Argos had for centuries depended on tourists for income, monks were supposed to be self-supporting, and they did have this stock of three hundred vials, too big for perfume and too small for wine. And they had running water. It is difficult to know what to think. Zorzi Cernovich was, said Sanudo, "a most handsome man, tall, and dressed in gold like a Greek." This is not Zorzi, but he is dressed in gold like a Greek, and suggests how marvellously exotic Cernovich must have appeared to the Venetians that wet grey day in December 1496 when he and his wife Isabetha, also in gold and covered with jewels, were introduced to society by Alvise Pasqualigo, the ship owner, at his home. Cernovich had escaped with Isabetha and his sons and court from the province of Montenegro which the Cernovici had ruled under the Venetian aegis until Ottoman pressure became too strong. Once in Venice, Cernovich was strategically removed from public access and assigned to command a troop of horsement stationed at the winter camp in Ravenna. Ravenna was wet and marshy, and Cernovich who was used to command everyone else had to obey orders. He was there for a year and a half. 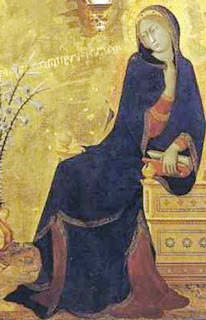 Ravenna was put under quarantine because of plague. The two rivers flooded the fortress. His soldiers were miserable from lack of pay. Venice had a war going on with Florence and he was not allowed to participate. There was another episode of plague. Half his soldiers decamped and went to fight for Florence which was currently paying. Cernovich finally got back to Venice in June, a year and a half after leaving, and made a complaint, several complaints. It was reported that he used "blasphemous" language. Nothing happened. He left, collected a band of armed soldiers from Ravenna, and reappeared with them in the piazza in Venice on July 1. This was tantamount to revolt. He was seized and put into prison. On July 4 the Dieci met and ordered him transferred to the Toreselle, a tower where the Bridge of Sighs is now. Imprisonment was not too severe, and he was allowed visitors. Then on July 12 Cernovich escaped. He left behind him his two guards, hands bound to their testicles. He walked out of the prison just before sunset and got into a boat there by the palazzo. A Greek guard who recognized him commented to the oarsman to take note of where they went, in case it was important. The oarsman took him to the north end of Lido, perhaps a half-hour journey, where he managed to acquire the garb of a Dominican friar. Meanwhile, the escape was officially discovered. The Dieci sent out boats across the lagoon in the dark Cernovich was recognized again, by a tax official who had been in conversation with the oarsman, who agreed to sail him across to Trieste for 16 ducats and a silver cup. He persuaded Cernovich to hide below the deck, and then sailed him back into Venice. Within four hours of his escape Cernovich was in the torture chamber. What happened there was not recorded, but Sanudo was able to go and see the friar's robe. Cernovich was held for eight days--public opinion thought a great deal of fuss was happening over very little--and then officially imprisoned for several months. In October, the Doge received a letter from Louis XII expressing deep interest in the Cernovich case--Louis was working with Cernovich's uncle Constantine, regent of Montferrat, on a possible war against the Turks. The Doge passed the letter on to the Dieci. In November Louis received a gift of furs and falcons from Venice with a comment that Cernovich had been released. He left town. He was seen again in August, dressed again like a Greek, and then joined his uncle and Louis XII in the attack on Milan. It was in Milan that he wrote his will in October 1499. This will was written as a letter to Isabetha, and it may be the earliest dated Venetian love-letter, not that it was either Venetian or a love-letter. More of the Cernovich story another time. This is the signature of John Palaiologos on the Document of Union in 1439 -- presumably uniting the Roman Catholic and Eastern Orthodox churches--and it indicates that he signed under extraordinary duress. John was a slight man, often ill, burdened since childhood with the responsibilities of being the oldest son and "young emperor" of an empire that had been disintegrating for generations before he was aware of his own responsibilities for it. His private life was complex and sad. When he was forty, he was struck with a sudden illness that was desperately painful and apparently paralyzed his limbs for a while. 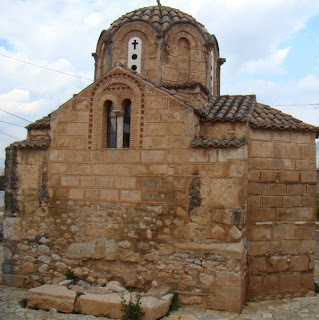 He was moved from his shabby palace--he and his wife and attendants were crowded into a few rooms of a huge rambling collection of buildings in desperate need of repair--to the Monastery of Ag. Giorgios Manganas where the monks apparently excelled at nursing. After forty days there, more or less, but the story wants forty, he was well enough to ride his horse in the Palm Sunday procession. Other writers on John said he had gout, but this sounds more like rheumatoid arthritis, and some of the subsequent medical reports fit the profile of rheumatoid arthritis. He was unwell in the summer of 1439 in Florence, when the Council on Union was grinding to an end, and he made a pilgrimage to nearby shrines at Pistoia and Prato. Pisanello referred to the pilgrimage on the reverse of the medal he designed. Returning to Florence, he was exhausted and needed to rest, and the account here (scroll down) was written by Giovanni di Jacopo di Latino de' Pigli whose unexpected guest he was. It is a charming account--John made his own salad and slept in the garden, but de' Pigli also says that he rode into the house on his horse because he had trouble walking. A historian who should have found more evidence wrote that this was the traditional way Byzantine emperors entered, but this was a man who was not well and he couldn't walk. The Council was pure hell for him, but his only chance of saving Constantinople from conquest by the Turks was with Western military aid, and the only way Western military aid was going to happen was if the Eastern Orthodox church joined the Roman Catholic: Popes since 1274 had used this promise to batter one emperor after another, and yet the aid had never quite appeared. The papacy claimed, generally, that the Eastern Orthodox church hadn't joined the Roman Catholic, only the emperors had, and that didn't count. So John took a delegation of just under 700 Greeks to Ferrara, then Florence, in 1437 for a church council--winter voyages by ship on the Mediterranean going and returning, near ship-wreck, and a stop on a deserted island for several days until John could get over his seasickness. They spent a while in Venice, being dazzled by the lovely palazzi along the canals, the evident public and private wealth, and the treasures from Constantinople they saw in Venetian churches. But when John arrived in Venice, he was unable to manage the formal welcome on the Doge's galley, and the Doge came on board his. Accounts of the voyage to and from the council, and of the council, are stippled with reports of times when John could not walk. At Ferrara, there was endless wrangling about protocol and processions and who would sit where and whose seat would have the most prominence--WWJD was not an idea that ever concerned church councils. The council opened in Holy Week of 1438. John wore a purple robe, and a great white skiadion with a large jewel on the back. He hunted almost constantly at Ferrara that summer. Perhaps one reason for that was that he could sit a horse when he couldn't walk, and hunting was something he could enjoy. And perhaps hunting was just about the only acceptable means he had of letting loose his anger--anger over the empire, anger over the church council, anger over Western promises, anger over the ritual humiliations of this council. In October John could barely walk and wanted the hall cleared while he was brought in. This was not permitted. He was in such pain that the only way they could get him into the council hall, while maintaining his dignity--John was desperate for dignity, was for the core of the Greek delegation to surround him--everyone else was taller than he--and then they carried him in by his elbows. By December he was bedridden from pain, too much pain to walk. The old Eastern Orthodox patriarch was bedridden, too, with heart trouble, and the two had to have their beds carried into the same room so they could discuss matters of the Greek delegation. Then there was the arrival in Florence after a winter journey over mountains from Ferrara and after many delays caused by incompetence in the Italian arrangements for rental horses. His formal entrance was on February 15, the Sunday of carnevale. John wore a white robe with a red mantle, a skiadion with a large ruby, and other jewels. The ladies of Florence were dressed in their finest, the balconies along the processional route were decorated and crowded with onlookers, people were climbing on roofs to watch, more were running along with the procession, and five cardinals were leading and following the imperial horse. All along the route bells were ringing and trumpets sounding. It had been sunny all day, but in the afternoon clouds began to gather, and as the Emperor neared Florence a light rain began. As he entered the gate of San Gallo there was a huge thunderclap and then the deluge. The spectators vanished, the Italian members of the council ran for shelter, the canopy-bearers let down their poles, water sheeted off the canopy and drenched him. John continued riding through the city until he reached the house where he was to stay. The surrounding cardinals were drenched, the Greeks in his entourage were drenched, and anyone who saw the Emperor saw a man whose aching body was weighted down by cold sopping wet clothes and a ruined hat. Then as John stepped across the threshold of his house and out of sight, the rain stopped. There was another incident, recorded by no one, but it can be deduced from the man's signature on the Document of Union. A comparison with other signatures of his makes it very clear what is happening. Physical suffering, Elaine Scarry wrote, destroys language. As John began to sign, he could barely control his pen which he could not lift for the omegas and their accents. For pistos through the first part of autōkra- he clenched his pen, printing, rather than signing. By -tor Romaiōn he was losing control again,. He forced ho Palaio- but the -logos is unreadable and he stabbed it on to the paper past where it belonged. Later signatures to duplicate copies of the document, written in private, were quite normal: it is this public signature that was forced. When he returned home to Constantinople, he found his beloved wife, Maria of Trebizons, had died two months earlier of plague, as had the wife of his brother Demetrios, who had accompanied him. The city was nearly in rebellion against him for signing the Document of Union, and the leaders were the new patriarch and his own mother. The churches dropped his name from the diptychs, which contained the names of those for whom it was required to pray. His mother, Helena, refused to pray for him. When he died, the patriarch refused him the usual church rituals. His brothers saw to it that he was buried with Maria. For more about John's physical misery, read about his trip to Italy.